IceWarp has the only solution that will display your Tasks on devices that do not support them (iPhone) by introducing the new ActiveSync Policy "Sync tasks as events". This feature merges Tasks into your calendar folder as “floating” events with the possibility to View, Add, Edit, or Delete the tasks. No software installation on your phone is required. Mobile devices such as the iPhone and iPad, lack the option to synchronize Tasks over Exchange ActiveSync. Ability to see daily tasks is extremely important to users switching from Windows Mobile, or to those used to organizing their daily tasks in Outlook. As with any other policy, Tasks as Events can be defined for all accounts (GroupWare - ActiveSync - Device Management - Global Policies..), or specifically for a domain or account (Domains & Accounts - Management - [domain/user] - Services - ActiveSync Devices.. - Domain Policies../Account Policies..). 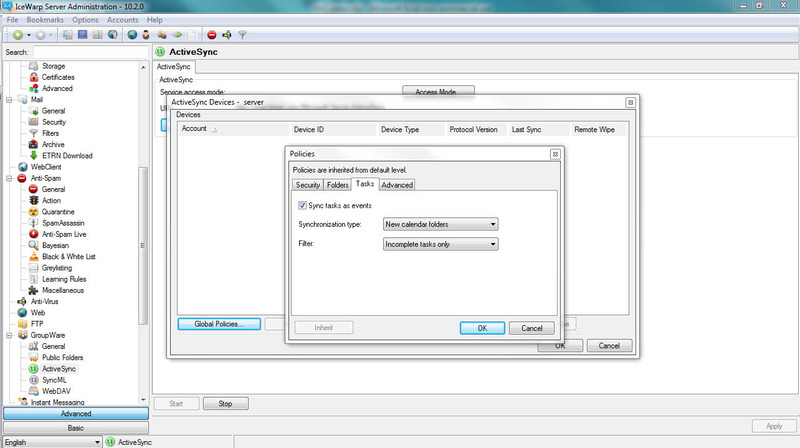 A common Policies configuration dialog opens. 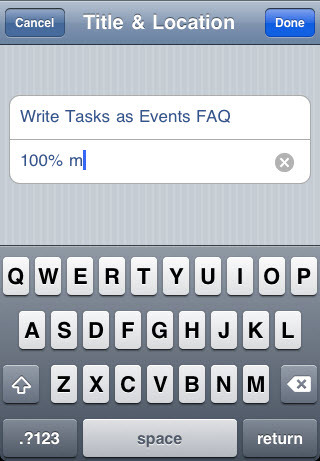 Switch to the Tasks tab and check "Sync tasks as events" to enable the feature. Select the Synchronization type. Generally it is recommended (for a global policy) to use the default "New Calendar Folder". 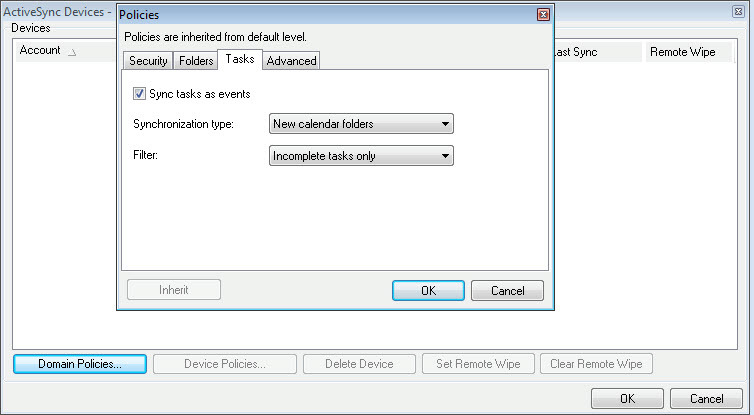 This ensures that a new calendar folder will be created and named after the already existing Tasks folder(s), i.e. typically "Tasks". This will appear as a new calendar on devices that support multiple calendars. Some devices are capable of synchronizing only one default calendar folder and in that case, you would opt for "Merge into default calendar folder", when configuring the policy for a specific account or better for a specific device. 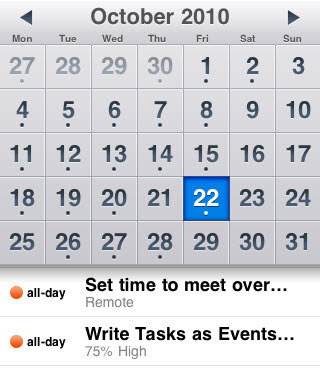 This ensures that the Tasks will be accessible on the device, although they will be mixed with calendar events. Select the Filter type. The default "All Tasks" is appropriate when a user has only simple tasks, not those specifically categorized by their completeness. In other cases and for more organized users, you may want to filter out the completed tasks so that they don't clutter the calendar (shortening sync time) by selecting "Incomplete tasks only". This allows for better management of tasks in general. On the current date- most of the tasks will appear as events for the current date: all future/past tasks with no start or due set; tasks with due or start date range falling into the current day; tasks set specifically for the day. For a range of dates- tasks that were set to happen during a specified interval (from start until due) will appear multiple times on each day. Those that have no due will appear until today; those that have no start will appear from today until their due date. Completed tasks- unless completed tasks are filtered out by the administrator setting, they will appear either on the date of their completion (=due date), or on a range of dates in the past (=from start until due). Note- If the task didn't have originally any start date, a default one will be assigned to it, equal to the day on which it was created. There are several possibilities for editing the tasks. Naturally you can edit tasks in Outlook on your desktop, or in the WebClient, and they would be synchronized to the device automatically. Let's take a look at the options to manage tasks directly on your device. The easiest operation to do from the device is to move the start or due date of the task. Simply edit the task in your calendar by selecting a different Starts or Ends date. The time doesn't matter in case of tasks, but it will be saved for your reference. You can use recurrence (each year/month) but rather than using daily recurrence, just set a start and due date, and the task will repeat in the calendar by design. Note- you cannot select blank start or blank due date- instead use today's date, e.g. for a general task to appear on the list each date until you complete/delete it, use Starts=Ends=Today. These are certain properties of tasks that do not have counterparts in a calendar event. Still they are essential for proper management of tasks when desktop client is unavailable. To change these properties, you will enter a set of special keywords into Location field- on the server it will be recognized that you are editing the corresponding task property and it will be reflected in Outlook and other clients. Percentage Keyword: the % sign must always be supplied.It indicates that you want to change the task property. If you omit it, the value you type into Location will be the actual location of the task. Completeness: The number before percentage sign designates the completeness level and is necessary only when you wish to change completeness. Status: 0% complete task will be set as Not started. 100% complete will be set as Completed. 1-99% will be set as In progress. Use %d for Deferred, %w for Waiting. Priority: Type the keyword h for High, m for Medium, l for low after the percentage, separated by a space. Errand: Enter the actual location for the task after the percentage. You can use a combination of keywords or just one of them. Note- All the characters are case insensitive. The last part ("errand") stands for the actual location to which you want to assign to the task. Currently, support for task location is not available in the WebClient, but that will be addressed in future releases. These are all properties that are common for an event or a task, or have counterparts in an event (e.g. use Attendees for participants). When you change them, they will be recorded for the task on the server too (e.g. the note). With respect to location, you can either set it along with other task properties in the same step as above, or you can separately set the status, completeness, sync back the task, and then use the Location field literally, to set the location. Using the same syntax, you can easily create a task by entering a new event in your calendar, and entering the keywords in the Location field. In the simplest case, you create an event starting today, ending today, and enter % into Location field- a general task will be created, which will appear each new day on your agenda- not as multiple events, but floating from each day to the other. You can add reminders, notes and participants in the same step. Tasks can be deleted just as events are deleted. The task will be completely removed from the device and server as well, and the information lost. Instead you may prefer to mark the task as complete, so that is out of your way for all future days in the calendar, but a reference to it remains. Marking tasks as complete is possible using the keyword syntax (100%) for the Location), or by making them due by setting the Ends value to today or to a day in past. The difference is that when a task is Complete, you can no longer edit its Start or Due date. For other applications (WebClient) they are still available in Tasks. On your phone they appear as floating events that will get pushed to each new day until completed or due. Keep a record of all your tasks regardless whether they have a due date, are expired, or aren’t completed. There is no need to install any 3rd party software for task management and synchronization. 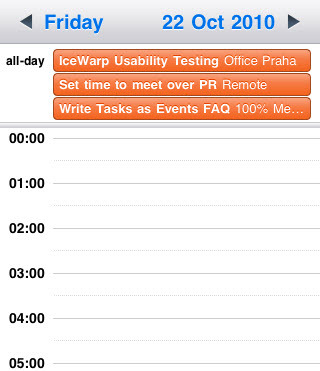 IceWarp has the only solution that will display your Tasks on devices that do not support them (iPhone and others) by merging them in your calendar folder (or create a new calendar for it) and making them float from one day to another so that you don’t forget them. There are many scenarios for adding, editing and managing the tasks directly on the device, allowing you to utilize many different advanced time management techniques. Does IceWarp Desktop Client support ActiveSync?